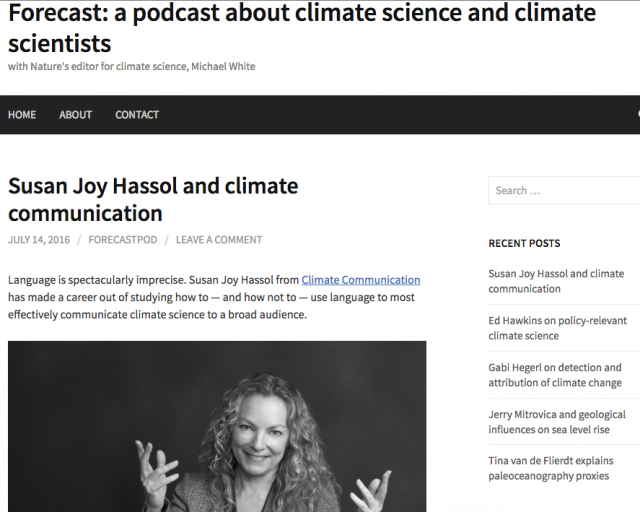 Nature magazine’s editor for climate science, Michael White, interviewed Director Susan Hassol for Forecast, a podcast about climate science and climate scientists. His interview focused on Susan’s career of studying how to — and how not to — use language to most effectively communicate climate science to a broad audience. He delves into some of the points she touches on in her TEDx talk – on word choice and simple, clear messages – as well as discussing her personal trajectory, and how she developed her skills and experience. The full, hour-long interview can be listened to here, along with a write-up and photos.